Consisting of three structures with the main passenger terminal located between Fremont and First Street, the Transbay Terminal site is next to San Francisco’s Financial District. BART and many of Muni’s bus and light rail lines are on Market Street, one block north, with many other Muni lines serving the Terminal directly. The Caltrain station is 1.5 miles south, at 4th and Townsend Streets. In 1959, when the Key System rails were removed from the bridge, the terminal was converted to bus-only use. 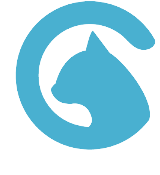 Its primary user from that time has been AC Transit; it was also used by a number of private and public carriers including Greyhound, Muni, Golden Gate, Gray Line and SamTrans. 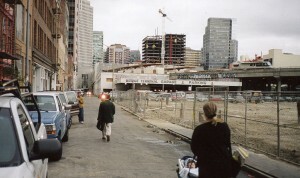 Although adjacent to the high-rent Financial District, the Transbay Terminal’s environs at First and Mission was a decayed area most travelers prefer to avoid. At its heyday, before the 1958 elimination of transbay rail service, over 200,000 people per day traveled through the Terminal. A number of forces have conspired to reduce this number, including the advent of BART. For many years prior the demolition, the Transbay Terminal acted as a shelter for many of the San Francisco’s homesless population. There were proposals to redevelop the Transbay site but with transit facilities be located elsewhere. 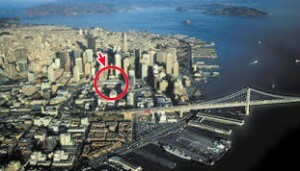 Location of the terminal in downtown SF. The terminal’s excellent location at First and Mission Streets explains the effort to save it and turn it into a regional intermodal transit hub that would connect Caltrain, Muni and BART to the regional bus systems. The old terminal was an underutilized and dated depot attempting to serve a fractured regional transportation network. The Terminal was not capable of meeting the projected demand for bus services from AC Transit and other providers. AC Transit is essential as BART transbay service is now operating at full capacity during peak hours. Moreover, reconstruction of the terminal provides the opportunity to integrate a downtown Caltrain connection with the bus facilities, as well as a potential rail crossing of the Bay. PR2000 has been an early advocate to extend Caltrain to Downtown San Francisco. Early studies completed in the early 1980s indicated feasibility of using the Transbay Terminal site for a new Caltrain station. According to the early studies, trains go would under the Embarcadero and the Bay Bridge and enter the terminal from the east side. In 1993, PR2000 member Michael Kiesling re-invigorateed Caltrain SF extension with his affordable proposal to tunnel the line to the Transbay Terminal. The PCJPB purchased the rights to Kiesling’s “Emperor Norton” proposal for the nominal sum of $10. In 1997, as environmental clearance was underway for the project, San Francisco Mayor Willie Brown opposed the Caltrain downtown extension, and blocked completion of studies needed to build it. This results in reprogramming of funds to “Rapid Rail” plan, emphasizing rehabilitation of rail line before any major upgrades. After SF activists including PR2000 campaigned to place a ballot initiative to move the downtown extension project forward, Mayor Willie Brown reversed his position again, to support the downtown extension, shortly before Prop H qualified for the ballot. After a campaign by SF-based groups and PR2000, SF voters passed Prop. H in 1999 with 69% of the vote. It requires city officials to seek funding for, and build, Caltrain/high speed rail downtown extension to a new or rebuilt terminal on the present site of the Transbay Transit Terminal, to protect right-of-way for the extension, and also to “pursue electrification of the Caltrain line from San Francisco to San Jose prior to or concurrent with the extension of Caltrain downtown”. In 2001, Transbay Joint Powers Authority (TJPA) was formed to oversee the planning, funding, and construction of the project. BayRail Alliance and launched a campaign for the passage of Assembly Bill 1419, which the state legislature approved by a 1-vote margin, to transfer Transbay Terminal land and development rights from Caltrans to San Francisco Redevelopment Agency to finance and build new terminal and Caltrain extension. Governor Davis vetoed the bill, but directed Caltrans to transfer the land administratively. 80 Natoma site, which the developer of the property threatened to derail the project. 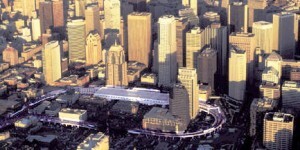 In 2004, BayRail Alliance, working with other groups in San Francisco, overcame opposition from a greedy developer and some neighborhood interests and convinces the SF Board of Supervisors to approve environmental documents for the Transbay Terminal project, which includes extending Caltrain and future high-speed rail. After the environmental document was approved, the developer sued the city which nearly halted planning work for the project. San Francisco eventually bought the property from the developer for $34 million. In 2006, TJPA held a design contest and chose a design by Pelli Clarke Pelli Architects. 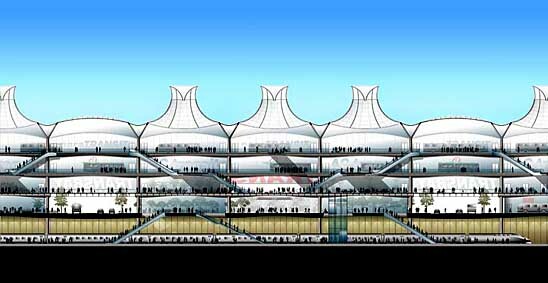 The design includes a glass covered terminal with a park above. An office tower would be built on Mission and 1st street and would be the highest in San Francisco. 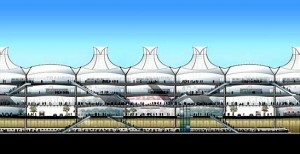 The naming rights of the tower and the terminal was sold to Salesforce. In 2008, after the passage of Proposition 1A and election of Barack Obama as president, opportunities were presented to build the train box at the same time as the construction of the new terminal. Prior to the 2008 election, engineers planned the terminal and train box to be built in separate phases. With the new ARRA funding for high speed rail, the train box project was moved forward to take advantage of construction efficiencies and create construction jobs at a period when unemployment rate in the construction industry was high. In 2009, when the project was almost ready for construction, Quentin Kopp, a member of the High Speed Rail Authority, made a final and unsuccessful attempt to kill the project by demanding excess station capacity for high speed trains and proposing an infeasible alternative of putting the train terminal at a different location. In August 2010, Transbay Terminal was closed to the public and demolition began. On the weekend of August 10, 2018, the community celebrated the opening of the Salesforce Transit Center. With phase 1 nearing completion, TJPA is now planning the second phase of the project to bring rail into the terminal.